This paper explains how to create reusable, interoperable lesson plans for e-learning using the IMS LD specification. Reusable lesson plans will enable instructors to share learning designs with other instructors and instructional designers and reduce the cost and time spent in designing e-learning material. We explain how to create three Learning Designs that are reusable lesson plans in the fields of information technology, language learning and science. We also discuss the methodology used to create the Learning Designs followed by an analysis of their capability for reuse and the pedagogical expressiveness of the specification. Finally, we discuss current research in improving the specification as well as increasing its adoption in the e-learning community. Current Learning Content Management Systems (LCMSs) enable teachers to post content and create courses using specific types of activities and a variety of digital content commonly referred to as learning objects. However, they do not enable the creation of reusable lesson plans. The activities, instructions and interactions that students engage in during a course is referred to as the teaching/learning process or the lesson plan. Since these LCMSs integrate the lesson plan with the content it is not possible to separate the teaching/learning process from the resources used within a course. Thus, the lesson plan cannot be shared and reused in the design of a different course. Also, this process is not interoperable among different LCMSs since no standard format for describing it is followed. In addition, LCMSs limit the pedagogical approaches that can be used in the design of a lesson plan since they provide a limited set of activities and resource types that can be used in the design of a lesson plan. A standard method is therefore required that describes any pedagogical approach for producing interoperable lesson plans, reusable among LMCSs (Koper 2005). The IMS Learning Design (IMS LD) specification (IMS Global Learning Consortium Inc. 2001a) has been heralded as the de facto standard for the description of instructional designs for e-learning systems. It is intended to encode the process of any learning situation in a standard way such that lesson plans are interoperable with any learning system. The ability to define any learning process in a standard way is essential to the provision of high quality learning since focus is placed on the pedagogical approaches ingrained in the design of lesson plans. Additionally, since these designs are interoperable with any learning system, they can be shared, improved and reused within the learning community. The process by which learning takes place has generated a lot of research interest, for instance, instructional design theories have been developed and debated upon in the educational research literature. According to Reigeluth (1999), an instructional-design theory is a theory that offers explicit guidance on how to better help people learn and develop; instructional design theories are design oriented, they describe methods of instruction and the situations in which those methods should be used. A standard way to describe an instructional design theory would be very useful and practical not only in the field of e-learning, but in the education community as well. The use of generic Instructional Designs (lesson plans, Learning Designs) can be extremely important in almost any teaching/learning scenario (Hedberg et al. 2002). The ability to share pedagogical strategies among teachers can have a big impact on learning situations and outcomes. Instructional Designs are useful to both teachers and learners as they outline how the content to be covered is to be taught or learnt. Learners can be guided through an Instructional Design (ID), for instance using a player for IDs or through following the instructions of a teacher. Teachers can use the ID in an online classroom setting by following the design and replacing content as necessary. They can thus reuse IDs developed by others by simply changing the content and hence reusing the pedagogical approach that is outlined in the ID. The teacher can also refine a particular ID to reflect his own teaching approach. Furthermore, he can share these IDs with others who can also improve upon them. In this way, IDs can benefit from many peer improvements and be extracted from its content to form high quality patterns or templates representative of a best practice approach to teaching a particular topic. However, the only way that this sort of collaboration and sharing of teaching approaches can occur is to develop a standard way to describe an ID so that everyone can easily read, alter and share such pedagogical approaches. This standard way of describing the instructional design of the learning process has emerged in the form of Educational Modeling Languages and more recently the IMS Learning Design Specification (IMS Global Learning Consortium Inc. 2001a). An Educational Modeling Language embodies the whole learning process and attempts to go beyond the notion of “content” as is described by standards such as SCORM (Advanced Distributed Learning 2001) and IMS Content Packaging (IMS Global Learning Consortium Inc. 2001b). The IMS Learning Design Specification provides a standard way to describe a lesson plan using any pedagogical approach and results in a Learning Design document that can be played in an LCMS that is compliant with the specification. LD is commonly explained as follows: a user carrying out a set of activities, using a specific environment, to achieve a specific objective. This sequence is specified in the method part of the LD. LD follows the metaphor of a theatrical play, where the method contains one or more simultaneous plays, which contains one or more sequential acts.The learning-design tag is at the top level and consists of a title, learning objectives, prerequisites, components and a method. Within a unit of learning, the learning-design tag replaces the organization tag in the Content Package manifest. Components consist of the core elements of the LD language which are the roles, activities, and environments and these are referred to by the method. The method describes the actual learning process using plays, acts, and role parts. A Learning Design can exist in different states at different stages in its life cycle. Figure 1 shows these states: authoring, production, and delivery (Paquette et al. 2005). The XML Learning Design document is authored by an instructional designer or teacher who expresses the steps involved in the learning process using the IMS LD notation. An authoring tool, graphical or XML-based, is used to create the Learning Design document. This document is specified in XML and must be named “imsmanifest.xml”. The LD document and all resources referenced within are combined in a ZIP file. The ZIP file is referred to as a Unit of Learning (UOL) and is passed on to the next stage for verification, validation and publication in preparation for the delivery of the UOL. The production stage makes the association between the LD XML document and the instance or run. This is done by uploading the ZIP file to a publisher, for instance, the CopperCore publisher (SourceForge 1999), which prepares the necessary information from the UOL. This production process involves both validation of the LD and setting up of the runtime environment. XML LD documents and templates are only complete when they are well-formed and valid, i.e., they must be syntactically and semantically validated. Once the syntax is valid according to the specification, the XML code is validated for references and consistency. After a complete UOL is ready, the runtime environment is set up. This is generally an administrative task which involves specifying runs, creating users, adding users to roles and runs and setting start times. Once this has been done, the runtime environment presents an instance or run of an LD to the users or members of the unit of learning. The final stage of the LD life cycle is the delivery stage, where a personalized instance of the LD is presented to the user via a delivery platform such as an LD player. There may be many users in a variety of roles associated with an LD run. Each of these users, who may be teachers, tutors, learners etc., is presented with a personalized run. There can be many runs, and each run has many personalized instances. Each individualized view informs the participant of the role that they must carry out, the hierarchy of activities to be performed, the environments available for each activity and the resources and content that are available for use. All user interactions between participants, whether or not they are in the same role, are dealt with by the runtime system via the interface presented to the participant. 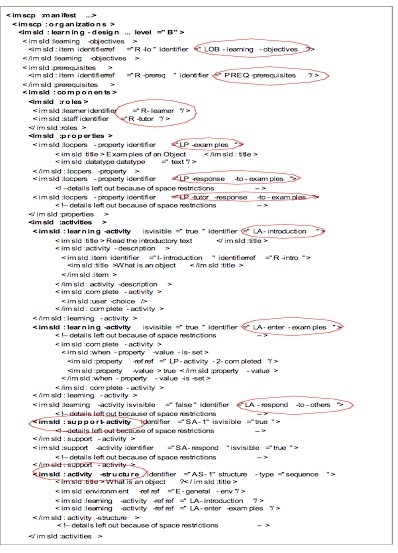 An IMS LD template refers to the Learning Design document without reference to any learning content, thus the template simply represents the pedagogical process behind the lesson plan for which learning material must be filled in.An IMS LD template can be reused by simply using the pedagogical process represented in the template and also including the relevant learning resources such as files that are specific to the course or topic being taught. Additionally, a Learning Design document (referred to as a UOL) can be reused in its entirety. For example, teaching a particular topic may involve the following steps – assign research questions to students, hold discussion about findings, request a written submission following discussions and finally give feedback on the submissions. A template can be created to describe this lesson plan or learning process. Since the template does not contain any resources, it can be applied to different topics or courses, for instance, such a template can be applied to a business case for information systems or the effects of user interface faults on user performance. The template is thus reusable in terms of the method or process of teaching/learning. The resources specific to each topic or course will be changed but the approach remains the same. For instance, the research questions, discussion outlines and instructions for submissions will be different for different topics/courses. On the other hand, the complete UOL containing the lesson plan and all resources can be reused in its entirety. For instance, the same UOL can be reused in another run of the course, by another instructor in the same institution or by another institution. In addition, anyone can improve on the document by modifying its lesson plan or resources and through sharing and further improvements; the document can become a widely accepted UOL of good quality. The Learning Design template is populated with content or learning objects for the relevant course and is run as an e-learning course or used as a lesson plan in face-to-face classes. Several Learning Designs are created following the methodology outlined in the IMS LD specification. Firstly, a description of the lesson plan is developed in plain language. Then, this narrative is analysed and a UML activity diagram is created that shows the workflows and parallel processes that occur in the lesson plan. 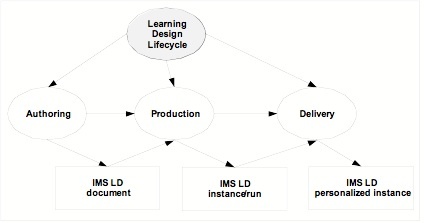 The UML diagram is then used to create the Learning Design document using the notation described in the IMS LD specification. We now show how this methodology can be used to create Learning Designss based on three different disciplines – information technology, science and language learning. Figures 2(a) and 2(b) show an example of a learning design represented using the IMS LD notation. It is based on parts of the “What is greatness?” use-case created by James Dalziel in (Dalziel 2005). This use-case was chosen since its pedagogical structure can be used in a lesson to explore the definition of any topic by simply changing the content of the LD document that represents the use-case. Thus, ‘What is greatness?’ is changed to ‘What is an Object?’ in the example below. The example shows a very simple template for a learning process that teaches students about software objects in a course on Object-Oriented Programming. An LD document is read from the method first. The method in this example consists of one play and two acts with each act specifying two role-parts. Within the first act, the first role-part, “RP-learner-1” (Figure 2(b)), contains an activity-structure, “AS-1”, which comprises two learning-activities (Figure 2(a)) and an environment. The role-part specifies which role performs which activity (who does what). The “AS-1” activity-structure presents an environment, in which the learner is asked to review some definitions of an object through resources provided. Next, the learner is asked to enter some examples of objects. The “LA-enter-examples” learning-activity has an activity-description that has an item which references the necessary resource. The LP-examples property is set for each user when examples are submitted by the learner. This activity is completed when the tutor indicates that it is complete via a set property. The second role-part in the first act specifies a support-activity, “SA-1” for the tutor role in which the tutor monitors the examples entered by each learner and sets the “LA-enter-examples” activity to be completed (the LP-activity-2-completed property is set). The second act allows the learner and the tutor to respond to the examples. The learner is given instructions to create an object in software, collaborating offline with other learners, to which the tutor must give a response. The learning design example allows a student to play the role of learner and the teacher to play the role of tutor. The learners are presented with the first activity in which they browse the available resources on the topic ‘Objects’. Each learner ends the activity individually, following which the second activity is presented. Learners are given instructions to submit examples of objects; meanwhile, the tutor reviews the submissions; this activity is ended by the tutor for all students. The last activity presents the learner with instructions to respond to the examples of other learners, while the tutor responds to each learner’s submission. The tutor ends this activity as well, and the run of the UOL is then completed. The learning design given in Figures 2(a) and 2(b) is a small fragment that may be used within a lesson to introduce a particular concept. Similarly, the example above can be reused for introducing topics in science such as “What is osmosis?” or “What is the law of inertia?”. The template described above can be used as is where the learning material alone changes to suit the science topic being taught. However, additional learning activities can be included to represent a more practical, ‘hands on’ experience. The example can also be modified to suit a particular purpose; for instance, the first learning activity can reference an environment which includes animated videos of the specific concept being taught. Also, the “LA-enter-examples” activity can be changed to allow learners to enter their own animation videos of a particular concept instead of text examples; in this case only the activity description would be changed. Finally, the example above can be reused without any changes to the Learning Design; the content for the specific science topic is simply included in the Unit of Learning. Firstly, an activity involving both learner and staff roles can be created using a conferencing environment in which students come together to define the question being raised about a particular phenomenon. Next, an activity can be created in which students are instructed to gather the necessary data. The third activity can involve submissions of hypotheses by each student or by groups of students. Next, the students must use the given environments to perform their experiments and collect and analyze the data. The next activity could ask students to interpret their results and submit their conclusions and results. Finally, the staff role could make each student’s experiments and results available to other students for the re-testing stage. This lesson plan could be created using the roles, activities and environments of IMS LD. It can then be reused by simply changing the question being defined in the first activity as well as any resources made available in the UOL. Teachers of foreign languages have been shifting their student’s focus from learning the vocabulary of a foreign language to developing oral and listening skills using techniques such as dictation and interaction with others to emphasize the social aspects of the foreign language. Increasingly, this shift in focus is being supported through online learning technologies such as video conferencing, audio streaming, discussion forums, chat tools, file-sharing, blogging or meeting foreign speakers (e-pals) online (CiLT, 2007), which goes back to the approach of Computer Assisted Language Learning (CALL) (Davies 2002). Although the IMS LD specification by itself is pedagogically neutral, instructional designers are free to use the specification to formalize learning processes using one or more pedagogical approaches of their choice. Instructional designers of language learning have recognized the value of theories of learning such as social constructivism by embracing the use of techniques such as collaboration between students, among others. Using IMS LD, it is possible to design instructional scenarios involving online technologies for collaboration as well as the use of interactive learning objects and educational resources for teaching and learning the theoretical aspects of a foreign language. In recent times, there has been an increase in the use of online technologies for learning foreign languages, especially those involving collaboration with learners and other persons. Computer-assisted language learning (CALL) is an approach to language teaching and learning in which computer technology is used as an aid to the presentation, reinforcement and assessment of material to be learned, usually including a substantial interactive element. A feature of many Multimedia CALL programs is the role-play activity, in which the learner can record his/her own voice and play it back as part of a continuous dialogue with a native speaker. Automatic Speech Recognition (ASR) software that can diagnose learners' errors, such as the Tell Me More Pro (Auralog 1987) is also part of Multimedia CALL. Web-based CALL includes audio and video conferencing in conjunction with other web-based activities. Web activities and role-playing in CALL programs can be described in IMS LD as part of the teaching strategy. Role-playing, where learners speak to each other while playing different roles can also be described in IMS LD. In order to exploit the latest technologies, language teachers must recognize that students are motivated to learn through such technologies and must include them in their lesson plans. Autonomous Technology-Assisted Language Learning (ATALL) describes the development and use of technological tools to facilitate language learning and research on the development and use of such tools. One study presents findings on the efficiency of an online learning environment that was developed to advance EFL (English as a Foreign Language) students’ intercultural competence by reading articles on topics of their own culture and communicating their responses with speakers of another culture. Students used a variety of online and collaborative tools including e-forums, e-referencing tools, and an online concordancer. The latest technologies described on the above web sites as well as the online and collaborative tools mentioned can be described in IMS LD using learning services. The many examples of online and collaborative language learning software packages, projects and research topics illustrates the numerous benefits of online, collaborative language learning. In particular, asynchronous, peer-to-peer learning through collaborative tools encourages reflection and evaluation beyond class contact time. The evaluation skills of learners can be developed through activities based on online resources prior to face-to-face sessions. The use of online discussion forums can support learners to arrive at solutions and develop their interpersonal and communication skills. Online interactive activities or virtual worlds can reflect real life situations in which learners can test their skills and understanding. All of these activities can be structured and described in IMS LD, and later reused as a complete lesson plan or part of another lesson plan. Many of these approaches require the use of collaborative tools which can be provided in Learning Designs via learning services. Collaborative activities can be supported online through learning services such as video conferencing, discussion forums (textual), chat tools, file sharing, blogging and meeting foreign speakers (e-pals) online (audio and textual). Learning services are a included as part of a Learning Design or lesson plan. Now we show how to build a Learning Design for learning French, in particular a week long lesson plan for teaching or learning introductory phonics. Figure 3 gives a representation of the lessons and its groupings for the French phonology Learning Design. This diagram is derived from the book, “Guidelines for a Language and Culture Learning Program” (Orwig 1999). It should be noted that this is not the only teaching process that can be represented using IMS LD - the lesson plan represented in Figure 2 can be modified or changed entirely. The phonology lesson plan contains four major types of activities: objectives, strategies, techniques and activities. 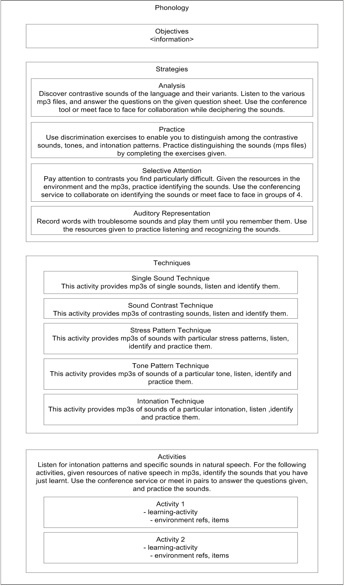 Strategies are broken down into analysis type and practice type activities and those that involve selective attention and auditory representation. Following these are the techniques that must be performed in this plan. There is also a section containing some supplementary activities that must be followed. All activities are eventually represented in the Learning Design document as either learning-activities or support-activities. Figure 3: A Lesson Plan for Teaching Introductory Phonics of the French Language. The roles that learners play within the learning process, the activities that they perform and the environments in which the activities are performed are specified in the components section of the Learning Design document. The learner and staff roles can be further divided into sub-learner and sub-staff roles. The activities section can contain any number of learning or support activities with each containing references that specify which environment is available for use for that activity. The activity structure groups learning and support activities, or even other activity structures in sequential or selection order of performance. Using the groupings in Figure 2, activity-structures are formed as follows. The first is AS-Phonology which contains three activity-structures, AS-strategies, AS-techniques, and AS-activities. The AS-strategies component contains four more activity-structures, with each containing learning-activities (LA) and within each LA, there are items that refer to resources and environment-refs that refer to environments. The AS-techniques component contains five activity-structures also with each containing LAs. Finally, the AS-activities structure contains two learning-activities. In this Learning Design the method would contain one play which has one act which has two role-parts. The first role-part specifies that the learnerrole will start from the AS-phonology activity-structure and the second role-part specifies that the tutor role will perform a support-activity throughout the lesson. The AS-phonology activity-structure leads sequentially depth first from one activity to the next until all are completed. This lesson plan can of course be made more sophisticated with the use of properties, conditions and notifications. For example, using properties to keep track of each user’s progress, the tutor can control when an activity ends, and when the whole group moves on together or individually. Notifications can also be used to notify the tutor when a student submits a question or an assignment. Conditions can further enrich the ordering of activities. Some foreign languages are similar in many ways due to their origins. For example, Italian, Spanish, and French have a common Latin influence and can benefit from the basic structures that are taught in Latin (Morton-Finney 1941). The Learning Design example in Figure 3 was made explicitly for learning the phonology of the French language. The pedagogical approach can be reused not just by changing the resources for teaching phonics of the French language, but by changing the resources for teaching phonics of any other language that is applicable. Thus, it is possible for an excellent Learning Design created for learning some aspect of French to be replicated for learning a similar aspect of Spanish, resulting in the sharing of best practices in language learning across languages. The reuse of Learning Designs can yield results in cost benefits since the cost of design is only incurred once. Learning Designs are shared and improved upon thus creating best practices in teaching. These benefits of IMS LD are achieved because the specification provides a standard way of communicating the processes of teaching and learning. Any instructional designer can use IMS LD to describe their particular teaching process and then share these designs for reuse and improvement. Reuse can refer to the reuse of the entire Learning Design, including all resources, or reuse of the Learning Design template by replacing the resources, or modification of the Learning Design document in terms of environments, activities, roles, and even the method of the Learning Design. The current pedagogical strategies for e-learning lean towards socio-constructivist, active and collaborative learning theories. These pedagogies require the use of collaborative tools which are provided in IMS LD via learning services. Pedagogical expressiveness of the specification is how well any learning scenario can be expressed in terms of completeness, pedagogical flexibility and personalization; in previous research we have showed that the pedagogical expressiveness of the specification can be improved through increasing the types of learning services such as chat, blog, wiki, mobile networking activities and many others, that can be included in a lesson plan (Ragbir & Mohan 2005; Ragbir & Mohan 2006). This is addressed by research to develop a framework for the addition of new services to the IMS LD specification in addition to the conference, email, monitor, and indexing services which already exist. By allowing more learning situations to be expressed in LD using such services, the pedagogical expressiveness of the specification is increased. Additionally, an editor that enables teachers to create Learning Designs that are compliant with the specification is also being developed (Ragbir & Mohan 2009). The specification is complex and educators are not equipped to utilize the technical notation of the specification for the creation of lesson plans (Westera et al. 2005). Consequently, the adoption of the specification is restricted to those who have technical expertise and to those institutions that can afford such specialized expertise. Thus, the creation of a high-level editor that enables non-IMS LD experts could be useful to teachers in creating lesson plans that are compliant with the specification. Further research in creating IMS LD templates that can be reused is being done. 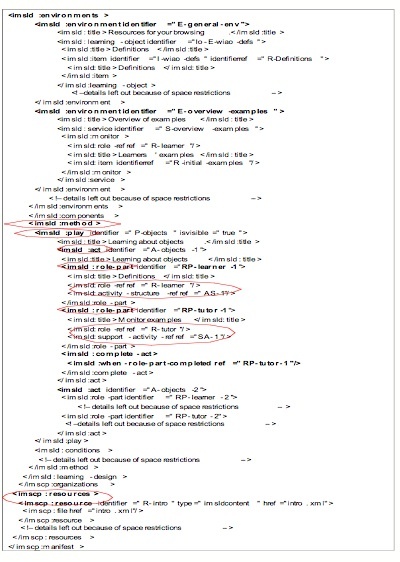 There has been work done to detect learning design patterns in LD documents (Brouns et al. 2005) and the creation of CLFPs (Collaborative Learning Flow Patterns) to capture best practices in CSCL (Computer Supported Collaborative Learning) using IMS LD (Hernandez-Leo, Asensio-Perez, and Dimitriadis 2005). Also, Moura-Filho and Derycke (2005) examined how the pedagogical patterns community and the IMS LD community could benefit from each other and attempted to create an IMS LD template from a pedagogical pattern. Further work is being undertaken to develop an algorithm for using pedagogical design patterns to create IMS LD templates. These templates can then be reused by using the pedagogical process encoded in the template. The IMS Learning Design specification describes a notation that can be used to encode any pedagogical process. This process is described in terms of activities that are performed by specific persons using a specific environment. We have shown how to use this specification to create three Learning Designs in various disciplines and have explored the need for improvement of the specification via services and a high-level tool. We have also outlined future research for improving the pedagogical expressiveness of the specification. Advanced Distributed Learning (ADL). 2001. The SCORM Overview: Sharable Content Object Reference Model Version 1.2. [cited October 25, 2005]. Available from:<http://www.adlnet.org/scorm/index.cfm>. Auralog 1987. [cited 10 January 2009]. Available from: <http://en.tellmemore.com/>. Brouns, F., R. Koper, J. Manderveld, J. Van Bruggen, P. Sloep, P. Van Rosmalen, C. Tattersall, and H. Vogten. 2005. A first exploration of an inductive analysis approach for detecting learning design patterns. Journal of Interactive Media in Education 2005(03). [cited July 2008]. Available from: <http://jime.open.ac.uk/2005/03>. SourceForge Inc. SourceForge.net: Projects – CopperCore. [online]. 1999-2008. [cited December 2005]. Availablefrom: <http://sourceforge.net/projects/coppercore >. Hedberg, J., R. Oliver, B. Harper, S. Wills, and S. Agostinho. 2002. Implementing Generic Learning Designs Based upon Quality ICT Exemplars. In Proc. 2002 International Conference on Computers in Education (ICCE'02), 03 - 06 December, 2002. pp 1011-1016. Auckland, New Zealand. Hernández-Leo, D., J.I. Asensio-Perez, and Y. Dimitriadis. 2005. Computational Representation of Collaborative Learning Flow Patterns using IMS Learning Design. Educational Technology & Society 8(4): 75-89. [cited June 2008]. Available from: <http://www.ifets.info/others/abstract.php?art_id=580>. IMS Global Learning Consortium Inc. (IMS GLC). 2001-2008a. IMS Global Learning Consortium:IMS Learning Design Specification - Information Model, Best Practice and Implementation Guide, Binding document, Schemas. [online]. 2003. [cited October 2005]. Available from: <http://www.imsglobal.org/learningdesign/index.cfm>. IMS Global Learning Consortium Inc. (IMS GLC). 2001-2008b. IMS Global Learning Consortium: Content Packaging Specification - Information Model, Best Practice and Implementation Guide, Binding document, Schemas. [online]. 2003. [cited December 2006]. Available from: <http://www.imsglobal.org/content/packaging/>. Koper, R. 2005. An Introduction to Learning Design. In Learning Design: A Handbook on Modelling and Delivering Networked Education and Training, edited by R. Koper and C. Tattersall, 3-20. Berlin Heidelberg New York: Springer. Morton-Finney, P. 1941. Latin, a Basis for French and Spanish Study as Evidenced by Teachers' Mark. The Modern Language Journal, 25 (11), 873-880. Paquette, G., O. Marino, I. De la Teja, K. Lundgren-Cayrol, M. Léonard, and J. Contamines. 2005. Implementation and Deployment of the IMS Learning Design Specification. Canadian Journal of Learning and Technology 31(2). [online]. 2005. [cited 10 January 2007]. Available from: <http://www.cjlt.ca/content/vol31.2/paquette.html#1>. Ragbir, D. & Mohan, P. 2005. Extending the Learning Design Specification with Services. In G. Richards (Ed. ), Proceedings of World Conference on E-Learning in Corporate, Government, Healthcare, and Higher Education 2005. pp. 2784-2792. Chesapeake, VA: AACE. Ragbir, D. & Mohan, P. 2006. The Potential of IMS Learning Design in eLearning. In Terry T. Kidd, Holim Song (Eds. ), Handbook of research on instructional systems and technology. IGI Global. PA: Idea Group. Ragbir, D. & Mohan, P. 2009. Design of an IMS LD Editor using non-IMS LD concepts. In Proc. Ninth IEEE International Conference on Advanced Learning Technologies (ICALT’09)15-17 July,2009, 251-255. Riga, Latvia. Reigeluth, C.M. 1999. What is instructional-design theory, and how is it changing? In Instructional-design theories and models: A new paradigm of instructional theory, edited by C.M. Reigeluth, Vol (ii): 425-459. Hillsdale, NJ: Lawrence Erlbaum Associates. Westera, W., F. Brouns, K. Pannekeet, J. Janssen, and J. Manderveld. 2005. Achieving E-learning with IMS Learning Design - Workflow Implications at the Open University of the Netherlands. Educational Technology & Society 8(3): 216-225. [online]. 2005. [cited June 2008]. Available from: <http://dspace.ou.nl/handle/1820/443>. 1The learning or education community refers to organizations and persons involved in teaching, developing learning materials and supporting learning in any way, including schools, training institutions, research institutions, educators, learning technologists and many others.